Our members really came through to make some amazing pieces, of all sizes, for the Pantone Quilt Challenge. 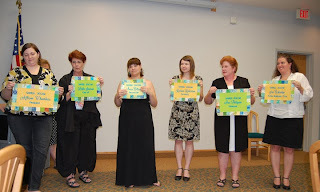 We had our big reveal at the August meeting. Thanks to everyone who participated in this unique innovative challenge. Check out our very active Facebook Group Page to see these pictures and leave comments to the talented quilters. A big huge ultra mega thanks goes out to all the board members for 2012-2013's year. You guys did an amazing job. We enjoyed an exciting ORIGINAL Block of the Month program, loads of retreats, much SEWcializing at our many bees and wonderful meeting programs. Thanks for a great guild! September 2013 marks the first meeting of the New Board Members. Let us take a gander at the boards. 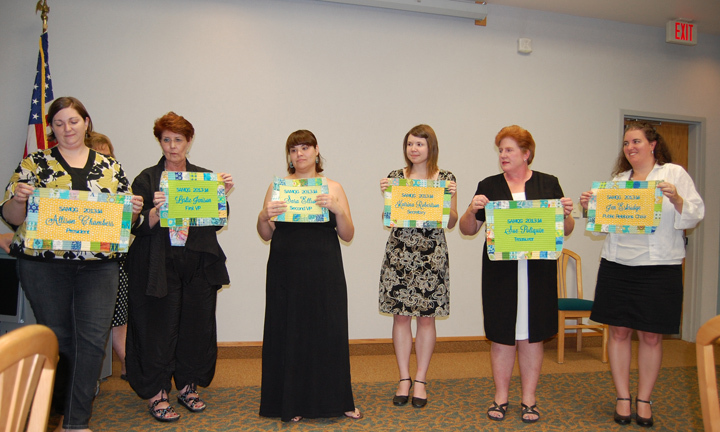 (above) Our out-going board members. Thanks again for all your hard work. L-R, Kim, Shae, Allison, Sara and Danielle. Here's President, Allison, holding her "welcome to the board" mini quilt. Congratulations and Good luck ladies! There's much work to be done. It cannot be done by a handful of determined gals, alone. If you are interested in volunteering for any numerous chair position please email Allison to see what fun things are still available.